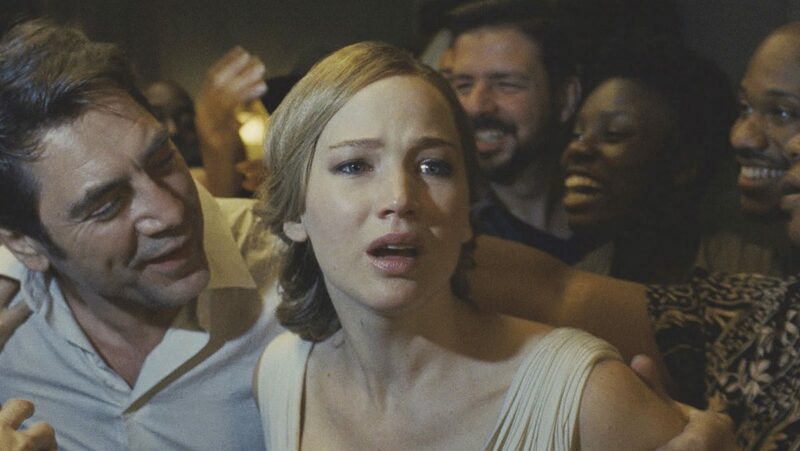 This image released by Paramount Pictures shows Jennifer Lawrence in a scene from "mother!" “mother!” is a film that is going to demand multiple interpretations, even after director Darren Aronofsky explains himself, and ultimately, I think that is its point. Whether viewed through the lens of religious or environmental allegory or a diatribe of the creative process, its full effect lies in the critical transaction between audience and visual text, in the details we notice and interpret through a subjective and unique lens. Being a horror film, this transaction means that interpretations can be self-serving, dangerous, or violent, and the real terror comes from the creator either losing control of the original meaning or intent of his work or indulging in the fame that work brings, thus debasing the purity of the process. As an acolyte says about art late in the film, “it affects everyone in a different way,” however misguided or terrifying that may be. As the film opens, we see a woman on fire, a single tear running down her cheek. Then, her burned home regenerates back to normal, and a man (Javier Bardem) places a chunk of unpolished quartz or glass the size of a large egg onto a stand in his study. Jennifer Lawrence and Bardem live in this house,but she was not the burning woman. Maybe she used to live in the house. Maybe her spirit is encapsulated in the quartz, or she wanders the halls at night. Because this is not explained outright, there is an unsettling aura around Lawrence’s character, as if she were being watched. It doesn’t help that she looks as delicate as the plastered walls she is painting, about to chip and flake away at the slightest vibration. Bathed in the sunlight streaming in from the old house’s many large windows, both she and the walls appear covered in alabaster with a sheer glaze, similar to religious statues in Elizabethan times. Actually, everything in the house seems unfinished, deliberately or not: the kitchen is full of antique appliances and reclaimed wood surfaces, each room is in a different state of completion, and the cellar is dark, damp, and spooky. The only room which seems in order is the upstairs study, and ironically it is hardly used as Bardem’s character, a poet, has a maddening case of writer’s block. Lawrence focuses on her room renovations; indeed, it’s as if she and the house communicate on its progress. She can feel the heart of the home by placing her hands on the walls, and there is a protectiveness she extends over it, wanting the color to match its personality. Interestingly, the people around her either don’t share such intuition or they gladly absolve themselves of it, looking through her instead of at her. Bardem treasures her as a precious thing, his muse and inspiration who “brought life back” into the house which had burned when he was a child (ah? ), but he rarely talks to her rather than at her. She is more a treasured object than partner, and he relies on her for his own sustenance rather than mutual benefit and growth. Suddenly, a stranger appears at their door, and the serenity of their secluded country life becomes isolated and tense as the man (Ed Harris) seems to know more about Bardem than he admits. Just being in their home leaves their surprise guest awestruck, and his concept of boundaries soon dissolves as he enters private rooms and touches private things almost to the point of violation, including the quartz on the stand. Soon, he reveals himself to be a huge fan of Bardem’s work, and while this changes the poet’s demeanor from hesitant to flattered, a rift emerges between husband and wife as the former indulges in the adulation while the latter is cast aside. “I love the man’s mind,” Harris says to Lawrence, who he describes as “not just a pretty face.” Lawrence admits she wants to “make (the house) a paradise,” and it serves as a womb of comfort for Bardem’s mind to lay fallow, regenerating its fertility until he is inspired again. She doesn’t have an identity other than serving him, and although this diminishes her agency, it also lends the objectivity of an outsider to the river of adulation that began as a trickle with Harris and his caustic, intrusive wife (a terrific Michelle Pfeiffer) and then quickly attracts a swirl of admirers eager for a piece of The Poet. Throughout the film, Lawrence ingests a mysterious yellow powder for chest pains. An attempt to keep the muse docile so she won’t leave? With her long blond hair often in braids, she seems like Rapunzel trapped in the tower, and even after a quarrel between Harris and Pfeiffer’s two sons turns violent and they rush off to the hospital, she is left alone in the now claustrophobic and suffocating house. After the tragedy, Bardem becomes a spiritual leader, his work becoming tenets of a new religion, and Aronofsky isn’t subtle about the references to the seven deadly sins: the greed of the two sons, the envy of Harris towards Lawrence, the sloth of Bardem’s ineptitude which soon turns to lust on a staircase after Lawrence asserts herself and challenges him as a man and a writer. When Lawrence becomes pregnant, Bardem sees this as a “most beautiful gift,” one meant for him and, as it inspires the seed of an idea, mirrors his creation of a new text. If the house is indeed a womb for his creation to grow, than by his personality it will soon give birth and, as he is selfish and self-centered, be replaced for a new idea to gestate and bear fruit. Once the fount of creativity produces a suitable product, its shell must be discarded. Suddenly, Bardem becomes the object of the people’s affection, while Lawrence is an avatar of his rapidly transforming divinity. As the crowd grows larger, it becomes more grotesque and cannibalizes itself, turning inward and devouring any piece of The Poet in a desperate, then gluttonous attempt at transubstantiation, to Lawrence’s horror. The pride of The Poet turns him into an emotional vampire, leeching every nutrient his wife provides until she is of no use, while her wrath is the final arc in the circle leading to destruction and life anew. As Bardem is awash in fame and adulation to the point of welcoming chaos as inspiration, so Lawrence is the imperfect, uncut piece that served his creativity well until he moves onto another. That is the horror within the bowels of the film.